On July 1 2007, England's public places and work premises became no smoking zones. The vast amount of media attention the 'ban' generated probably ensured that there wasn't a single adult in the UK who was not aware of the change in the law, but the law requires signs to be displayed to reinforce the legislation. You are not permitted to smoke in virtually all enclosed public places, workplaces and in any public or work vehicle. The ban includes all smoking materials, including cigarettes, pipes (including water pipes), cigars and herbal cigarettes. Breaking the law is a criminal offense. As most business owners are probably now aware, the law requires all business owners to take reasonable steps to prevent people from smoking on their premises or in their vehicles. For example, you might wish to implement a smoke-free policy, so all staff are clear on your position. No smoking signs are still required on any premises with either staff or public access, and must be at least A5 in size. Fire Protection Online stock two types of sign; an adhesive version and a plain plastic version, that both comply with the law on lettering and symbol size. 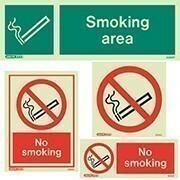 Smaller signs may be used in addition to the A5 size sign in designated staff-only areas, or where the area signed is already within a larger smoke-free remises, such as an office, shopping centre or factory. Remember, the no smoking legislation also applies to all shared company vehicles, so you should ensure that all your company transport pool vehicles are equipped with no smoking signs. If your vehicles are only used for voluntary work, such as those belonging to a charity, they must also be smoke-free. No Smoking: "Substantially Enclosed Premises"
Smoking is not permitted in any substantially enclosed premises, and yes, that includes any outside shed with a roof with more than 50% enclosing walls. Therefore, the ban also applies to your outdoor marquees, tents, or temporary stores, so make sure you have sufficient no smoking signs to use in these areas, as well as your main business premises. your office must be smoke-free. If your office shares a stairwell or similar enclosed space with other premises that the public might use, these must also be smoke-free. This also means that if your flat shares a lobby area with even just one other flat, it must be kept smoke-free and display a no smoking sign. As the business owner, you can be fined up to Â£2500 for allowing people to smoke on your premises.